"Now that the rightful ruler of Neospes has been reinstated, Riven is on the hunt for her father in the Otherworld to bring him to justice for his crimes against her people. When she receives an unwelcome visit from two former allies, she knows that trouble is brewing again in Neospes. The army has been decimated and there are precious few left to fight this mysterious new threat. To muster a first line of defense, her people need help from the one person Riven loathes most - her father. But what he wants in return is her complete surrender to him. Riven will have to choose: save Neospes or save herself." I LOVED The Almost Girl and I am so excited we are getting this sequel! NEED IT! 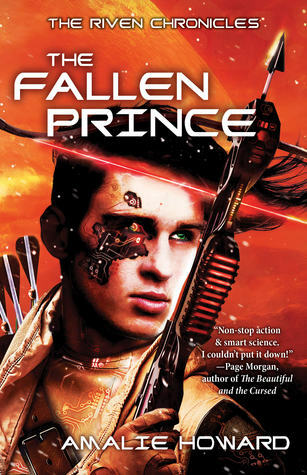 The Fallen Prince will be released on April 5, 2016. I didn't read the first on in this series but this one looks great. I wonder what her daddy wants. Ooh nice! That's a totally new to me one! Hope you enjoy it once you read it! Eeeep! That cover is super cool! I hope the sequel lives up to your expectations Teresa! Awesome pick! I remember wanting to read the first book. Definitely have to when I can. Love the cover for this one! *MUGGLE HUGGLES* I hope you are having an AWESOME day!! This is the first I've heard of this series. I may have to check it out! Oh, Wifey! That is a really cool cover! This is on my list. Awesome WoW pick, lobster! THAT COVER! Hope you enjoy this one once it's in your hands!